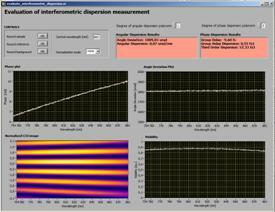 Full dispersion measurement with FRINGER apowerful 2D interferogram processing software. There are numerous ways how Spectrally and Spatially Resolved Interferometry (SSRI) can be useful for you. Designed for capturing and evaluation of spectrally and spatially resolved interference fringes, Fringer can measure spectral phase shift and angular dispersion of ultrashort pulses by extreme accuracy. The two-dimensional feature of the detector allows you to explore any spatial dependence along the beam diameter. Real-time evaluation of the interference patterns and triggered exposition of images are also possible with CEOptics’ Fringer. Although an SSRI measurement requires a two-beam interferometer with the object of interest positioned into the sample arm before the spectrograph; non-interferometric measurements also provide great opportunity for beam diagnostics and alternative angular dispersion measurement (with only an extra achromat needed for focusing). 3) The range and accuracy depend on the specifications of the imaging spectrograph. The displayed values are for colour depth of 10 bit, spectral resolution of 0.1 nm, spatial resolution of 3.3 μm and around 800 nm. 4) For an achromatic lens of a focal length 50 cm and a beam size of 3 mm. 5) Depends also on the detector specifications of the spectrograph. 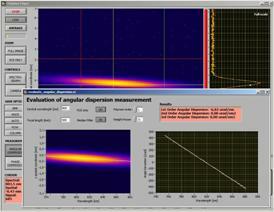 PhADIM a phase front angular disperion measurement unit. 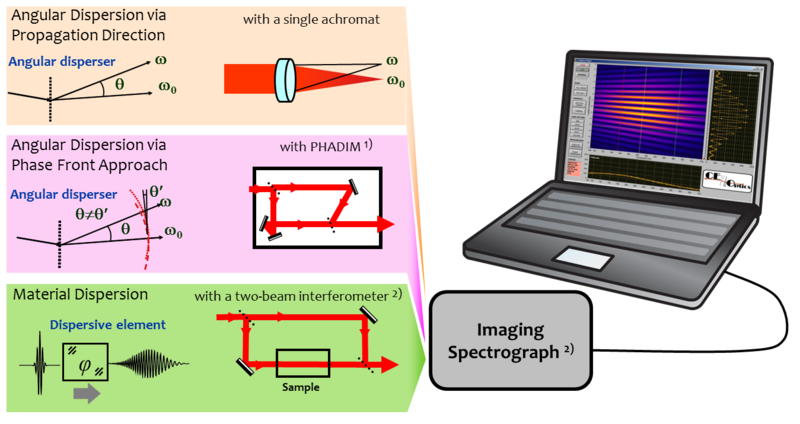 2D spectrograph (e.g. CEO-2D-800 by CEOptics).